The feature I want to talk about today is, in a way, a small revolution. But before, let's go back in time for a minute. In my initial vision, PlantCatching had to be a tool centered on fast and spontaneous plant sharing, and it did well in this domain so far. This aspect can be seen with the map who is visible on the homepage, letting people know at a glance what is offered in their area, or also by the fact that the sharing form is one click away in the top menu and that one doesn't need an account to do that. All this is very important and must not be changed. But a few people sent me some comments and brought my attention to the place given to all users on the platform. For example, I was asked this question: "How can I contact again a person with whom I had shared something in the past? I have something to ask him or I would like to offer a plant we were talking about". In its current state, PlantCatching is of no help. I thought that the number of users has greatly increased also. So far, I was seeing this web site as a tool, not as a movement (as Incredible Edible for instance). But can't we start to see it as a network? Does it have the power to bring together, under a same banner, one where people share, those thousands of gardeners that are either isolated or part of a community or a larger movement? That's why I decided to work on a stronger community. I would like to see every user proud to be part of it and keen to talk about it. It's in this spirit that I want to introduce you to the new user profiles. 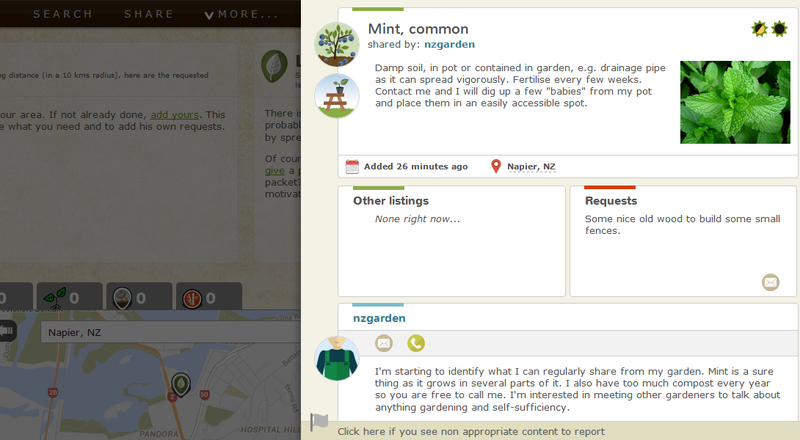 Note that there is no question of creating a Facebook for gardeners. It would be too complex and too long, and even unwelcome. I have to be pragmatic and create only the features allowing to solve the problems I mentioned above: be able to identify and find someone you already met, and create a nice and strong community. And of course, a profile must be optional since not everybody wants one. For these people, nothing changes. Note that you rname and the last part of the URL does not need to be the same (e.g. "Happy seeds supplier" as your name and "freetheseeds" in the URL). Someone visiting your URL will be directed to the homepage with the sliding panel opened and showing your content as above. You will give your card to the gardener with whom you are sharing something. Write what was just given or received or any other information that you find important. It will help remembering who was the person and the context of the sharing. He can do exactly the same. It's like swapping business cards! 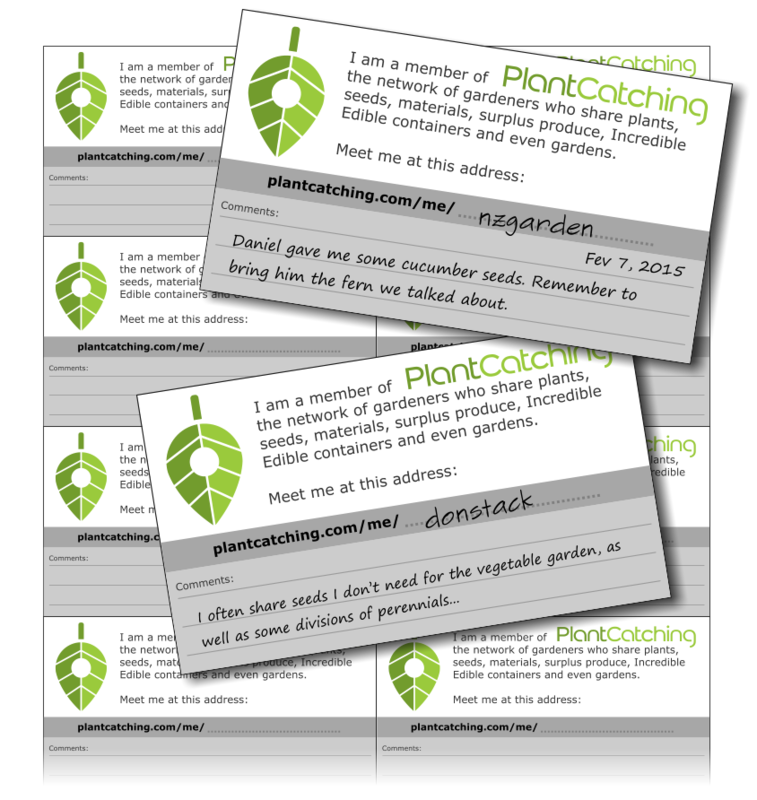 Distribute them also to people who don't know PlantCatching. This is a way to say "Give a visit to this site and you will be able to meet me there too". Useful and promotional. It can also be pinned to a plant you are sharing in public mode, in the street, while you are not there. And it's possible that you will use it in an original way I didn't expect. In that case, let me know and share it with others. Obviously, once you are known by a particular name, with member cards already in the wild, it's better not to change your nickname, otherwise you will be lost for all the people who know you. At last, let me remind you that this was a lot of work. I did my best to make it ready somewhere duing the next weeks. You will maybe see bugs or parts of the site that seem unfinished. I invite you to give me feedback and reports so that I can finetune and fix them. All this is a constant experimentation and has been so since the beginning. Also, tell me your thoughts about the profiles in general. Help me build the site in the right direction.